We’d love your help. 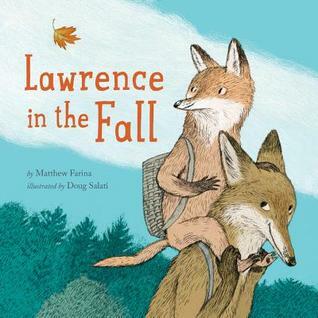 Let us know what’s wrong with this preview of Lawrence in the Fall by Matthew Farina. Luckily, Papa knows just what to do to help! Together, they venture into the woods. Lawrence is scared at first, but as he grows comfortable in the forest, he starts to recognize its magic, and how beautiful and uniq When Lawrence Fox's teacher announces that students will be presenting their collections at show-and-tell, Lawrence realizes he doesn't have anything to share. To ask other readers questions about Lawrence in the Fall, please sign up. Lovely story and expressive illustrations. Fox needed a collection to show at school, but unfortunately he didn't have one. So he and his father set out on an adventure to find one. yello one with rounded edges." LAWRENCE IN THE FALL is a beautiful story about a little fox who needs to show his collection at school. But, he doesn't have a collection! Little Fox forages the forest with Papa, eventually finding a beautiful collection of his own. Expressive illustrations pair with this story to create the kind of story that will evoke discussion about nature, trees, collections, getting lost, and show and tell. A young fox cannot figure out what to take to show and tell until they and their father walk in the woods. Nice to see Lawrence avoid the consumerism pushed on him at school and instead pursue outdoor adventures with his father and his friends. Sweet, inspiring and nonjudgmental. Lovely story about finding your own and sharing it--such an important message to impart to our kiddos! Thanks for sending ARC for review my way, Disney Books! Lawrence does not have any collection to share at show-and-tell. His dad leads him through the woods to find something. Lawrence finds all unique leaves to share with his different classmates. This is a really cute book. I like the story and I'm partial to trees, so I liked that part, and there was a general sense of kindness and friendship in this book. Cool book about finding something you're interested in by just walking around outdoors and seeing what gives you a spark.